Three years have passed since the United States launched an illegal war of aggression on the sovereign Republic of Iraq. Neither were weapons of mass destruction found nor democracy or human rights advanced. Within one month, Iraqis will enter their fourth year as a people under occupation, ruled by a puppet regime that sanctions death squads and torture. The time has long passed for this to end. In the absence of a sovereign Iraqi government — which cannot exist, by definition, under occupation — the US-led Multi-National Forces in Iraq (MNF-I) are legally responsible, and imputable, for the failure to protect even the most basic of all human rights principles: the right to life. The current situation is intolerable. Workers in the morgue of Baghdad alone report that on average 1600 corpses are brought in every month. Following the criminal destruction of Al-Askari mosque in Samarra, these same workers report that 1300 dead were brought in over a period of seven days. The US-led occupation has consciously led Iraq to the verge of disintegration. The country is being plundered. Torture and assassinations are endemic. Women and children have borne an equal share of the violence. The occupation is running out of space for prisoners. Cities have been targeted and destroyed in a programme of urbicide — Fallujah, Tel Afar, Al-Qaim, Haditha. US coordinated air strikes and related military interventions are the biggest killer in Iraq. Repeated polls in Iraq have shown that Iraqis believe they would be safer if foreign troops left. As the year 2006 opens, we have no other conclusion to draw except that the United States has intended destruction upon the people of Iraq. The use of depleted uranium weaponry will leave a scar on Iraq for billions of years. All public services have collapsed — health, water, electricity, communications, justice and security. The occupation has done nothing to protect Iraqis. Refusing to safeguard civilians is as much a violation of international law as the criminal use of chemical agents — such as white phosphorus on Fallujah and Tel Afar. 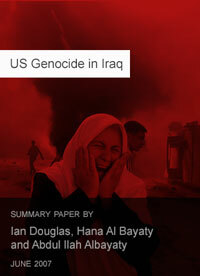 Criminal inaction, especially following the Samarra atrocity — the US military standing by as death squads roam the streets of Iraq — has highlighted with precision the underlying rationality of the US presence in Iraq: impoverish the country, break it up, foment sectarian hatred, stand back and watch the killing fields swallow the population. The international community has failed Iraq, and the Iraqi people. A decade of silence over murderous sanctions has been compounded with timidity as the United States overturned a century of legal regulation and waged an illegal preemptive war on a state that was already on its knees. [pullquote align=”right”] When the powerful claim a state of exception to law the rights and obligations of all are undermined [/pullquote] The BRussells Tribunal, in solidarity with the Iraqi people and its struggle to recover sovereignty, calls on all international organizations and institutions that work towards upholding international law, as well as national parliaments and regional organizations, to act now and with purpose. International institutions, monitoring bodies and parliaments must recognize the gravity of the situation and act to protect the life and person of all Iraq civilians, condemn US policies in Iraq, demand the unconditional and immediate withdrawal of all foreign forces, demand the US and all other occupying powers pay reparations to Iraq and compensation to Iraqis for the human and material destruction wrought, restore in full Iraqi sovereignty, recognize as null and void any treaty, law or contract passed under occupation, and bring again a semblance of credibility to the legal underpinnings of international society. When the powerful claim a state of exception to law the rights and obligations of all are undermined. The situation in Iraq is disgrace to us all. It is time for all actors in positions of authority and influence to rediscover their conscience, as well as their mandate and legal obligations, and speak up and ensure the end of this atrocity now. The BRussells Tribunal calls on all to endorse this appeal, contact members of relevant institutions and parliaments, and diffuse this appeal within your organization or country, to deputies and co-workers and colleagues and others.